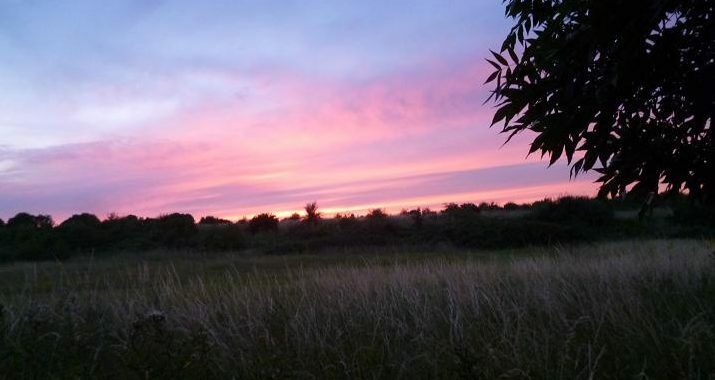 I had been promising myself an evening on the local duck pond all summer, but scorching temperatures, not pleasant at the best of times, followed by storms and heavy showers sweeping across the the country had limited fishing time. Finding a free evening when it wasn’t raining, I took the short five minute drive to the pond. It takes longer to load and then unload the van again, than it takes to drive to the car park nestled among the estate’s houses. In my younger, fitter days, a brisk walk with the trolley would have completed the task, but today it’s what it is. There were already several anglers set up around the 2 acre balancing pond, some more committed than others. No one seemed to have caught so far as I walked round, finding an open space opposite the island and next to a proper carp fisherman huddled in a chair watching his rods in a gap between trees. Not having fished here since the winter, a white tide mark on the rocks lining the island, indicated that the level had dropped by at least 6 inches, not good in this already shallow water. I had heard that Thames Water had been doing work at the site. Lowering the outlet height would allow more water to be released during heavy rainfall, no doubt protecting the local houses, but not improving the fish habitat. As usual, I had only brought bread for the punch and about half a pint of liquidised bread for feed, to which I mixed in a dusting of ground pellets. Wetting the feed mix, I threw out four loose balls along a line twenty yards out, that broke up on contact with the surface. By the time I had tackled up my 12.5 foot Normark rod, bubbles were already beginning to appear in the baited area. 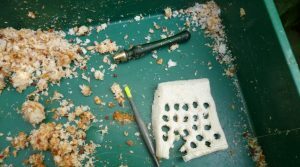 Double punching 7 mm pellets onto the size 14 hook, the tip dipped seconds after my modified pole float hit the water. With no weight down the line and set to 15 inches deep, the bread was being pushed around by a fish, causing the float to dance around the surface without going under. 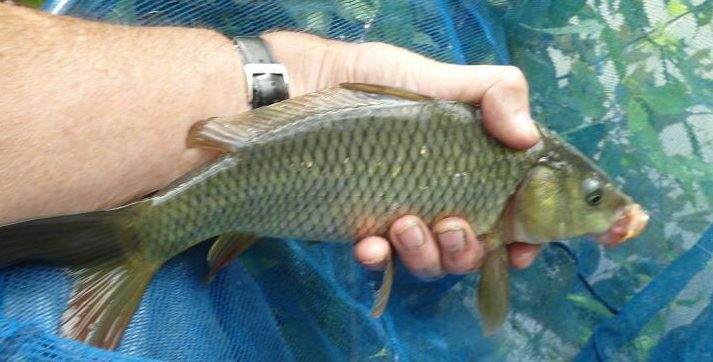 Last summer the rudd in the pond were a nuisance, although worth catching once hooked. The float eventually stopped moving and assuming that the bread had been sucked off the hook, I lifted the rod to retrieve the float, only to find briefly that a carp was still holding the bait. The rod pulled down to the surface, then a bow wave heading toward the island said that the carp was gone. The silly bites continued, the rudd seemingly doing a disappearing act this year, had left it to the carp to test my patience. Many times the float sank, to reappear a second later before a strike could be made. I lost count of the missed fish. One bite sailed away behind a bow wave, the line following. I tightened and leaned into thin air. Very frustrating. Finally, the float held down long enough to make contact and the rod bent double into a running carp that trailed a slick of black mud, as it headed for the overhanging branches of the island. Back winding against the strain, the carp’s tail broke the surface in the shallow water, picking up a washing line of twigs, when it burrowed into the mud. Turning, it came back into the open water, where it was soon on its way to the net, although close to the bank it was almost beached, getting my net under it at full extension. The commotion brought the serious carp man on the left to my side. He was yet to catch. The hook was just in the bottom lip of this five pound common. A lucky fish indeed. 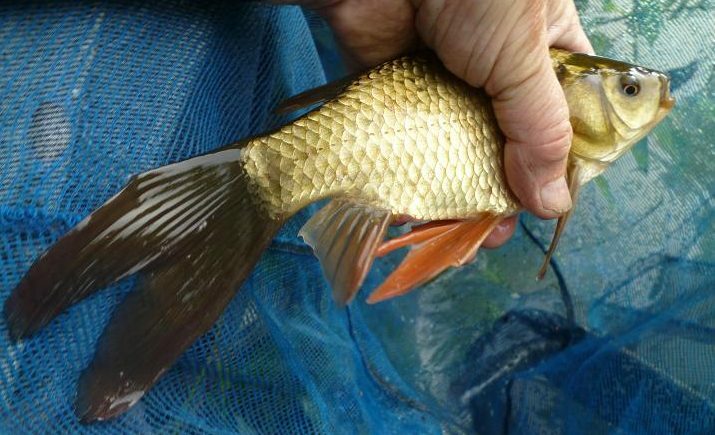 I like to keep my fish in the keepnet, until I finish, but the water was too shallow to cover the back of a carp, so it was returned without weighing. My new companion stayed with me for a while, giving a running commentary on the iffy bites, uttering reassuring gasps every time I missed a fish. He talked of wafters and popups, artificial maggots and sweet corn, all foreign language to an old bread man like me. The Bread has done me proud so far, so why change. A single pellet on the hook brought another rod bender, this time a barrel shaped mirror carp that ran hard to my right, out of sight behind a bush, where it wallowed on the surface like a stranded hippo. Sinking the rod tip into the mud in front of me, I reeled in and it followed, before running for the middle one more time. More back winding soon sapped its strength, turning on it’s side ready for the net. It was still only 7:30, two carp in a hour and plenty of action in between. This mirror was the icing on the cake, but having intended fishing into the dusk, I rebaited with another single pellet and cast out. The baited area had given up its last fish and I cast another ten yards close to the island. The float sat without movement for five minutes, then vanished. Missed it! A boil spread out, where the carp had been. Same again next cast, but this time the fish stayed on, relentlessly speeding toward the island, then running parallel to it. Everything went solid. Keeping the rod up, I could feel the carp the other side of the snag. Lowering the rod and giving line got the fish moving, but lifting in again, the line went solid, with the carp making waves the other side of the snag. The 6 lb line parted and my precious float bobbed to the surface. I will have to make up another one before my next outing. Time to go home. I offered my fellow angler a couple of pieces of bread. He said he had missed a run on his floating artificial double sweetcorn pop up rig. He took the bread. 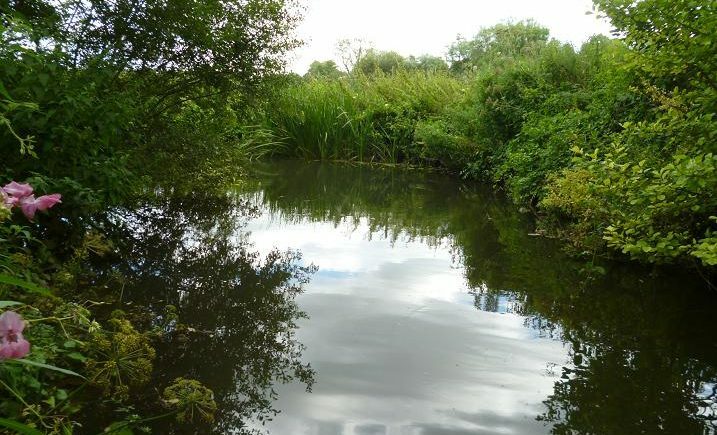 Continued hot and humid weather had banished any thoughts of fishing, but a freshening breeze and a forecast of thunderstorms by 7 pm, saw me liquidising a few slices of bread thawed from the freezer, with another slice for the punch, ready for the 10 minute walk to my local pond. 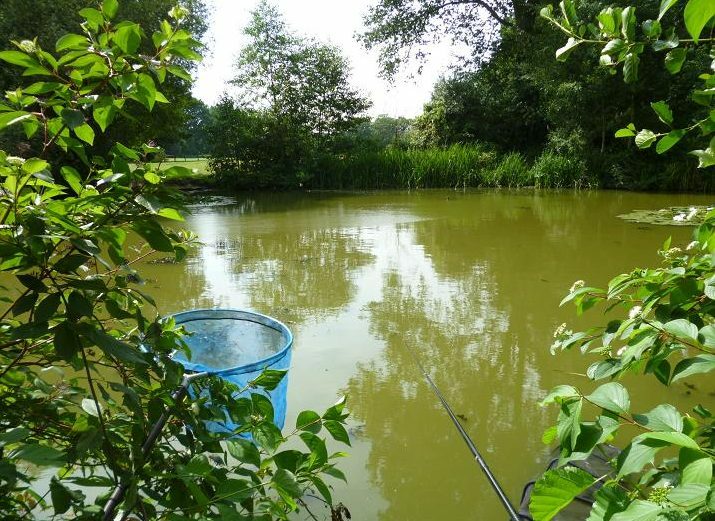 Despite travelling light with just a pole and landing net, while my tackle box was loaded on the trolley with the barest of essentials, I’d seemingly sweated buckets by the time I reached the pond. The shaded swims all have dense lily beds alongside them, safe havens for running carp, so I chose to fish into open water, although it meant sitting in the full heat of the sun. In this shallow swim, pole length is limited to six metres by a high bank behind, just allowing the top two sections to be unshipped when landing a fish, so with a short terminal rig, seven metres is the ideal fishing distance. I had been given some 2 mm krill pellets by a friend and added a handful to my ground bait mix of liquidised bread and ground carp pellets. The friend had said the krill pellets were a good tench attractor and knowing they are present in the pond it was worth a trial. Having fed three balls along the seven metre line, the float sank away the instant the 6 mm bread pellet reached the bottom and a colourful rudd was swinging to hand. 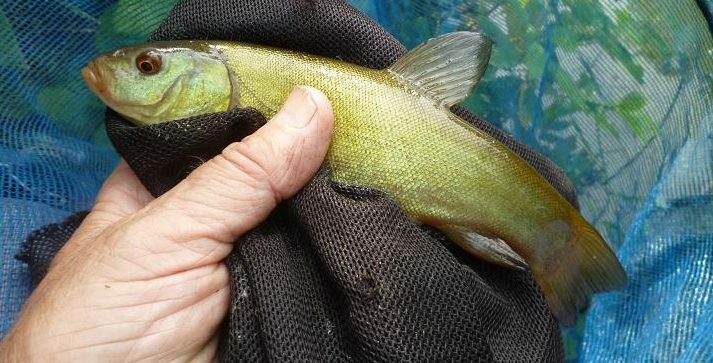 For the next twenty minutes it was a rudd a chuck, until a different bite saw the pole elastic extending as a small powerful tench came fighting to the net. Maybe the krill pellets were working already. 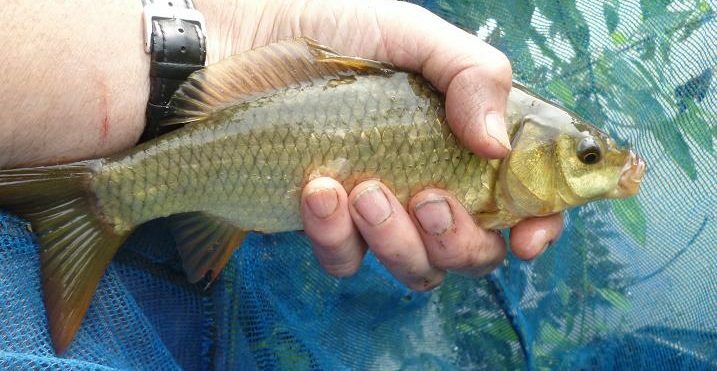 Bubbles were now surfacing from the fed area and a dithering bite brought another change of fish as a small crucian carp came to hand. The rudd had been pushed out by now and the elastic stretching out across the pond signalled a carp run. Shipping back the pole to the top two sections, the elastic took the strain, bring the carp steadily toward the landing net. 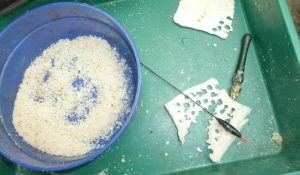 The punched bread was working well, with more crucians and small commons taking each put in, every punch representing a fish. Putting in another three balls kept the bites and fish coming, including another tench dashing around the swim. 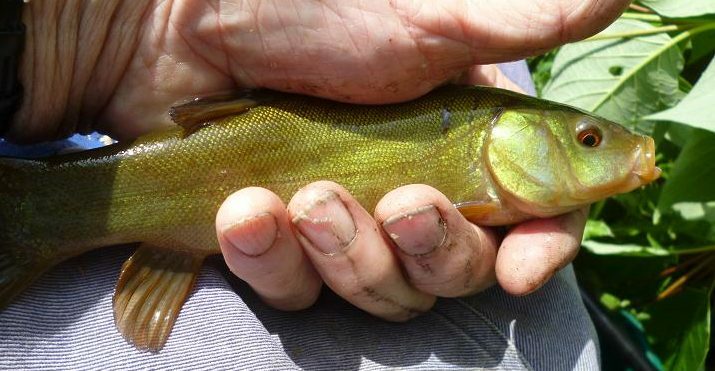 Small tench were now every other fish, while the occasional better common kept me on my toes. I’d set a cut off time of six thirty, giving me three hours fishing time and on the dot the float went down with another hard fighting carp, this time an exotic fan tail, that would have been more at home in a garden pond. In the previous hour the sky had darkened and the wind increased, that forecast of heavy rain seemed likely to be accurate and I pulled in the keepnet, this net falling just short of ten pounds. 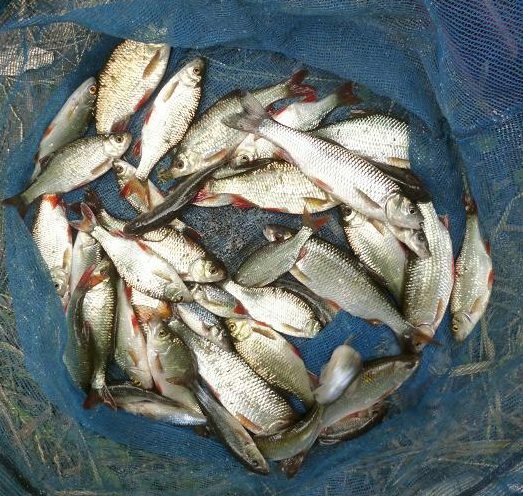 There were eight tench in amongst this catch, so maybe the krill pellets did the trick? Half way up the hill to my home, it began to spot with rain and only wearing a T shirt expected a soaking, but made made it with a minute to spare before the heavens opened. A call from one of my landowners saying that his paddock was once again full of rabbits, saw me set off after rush hour on a balmy July evening, being met at the gate by Ray, who walked me through to the paddock, apologising for the fact that there were now only a few young kits visible. This is typical of many such calls, but undeterred I unsheathed the rifle and promptly dispatched the largest in view. The crack from the HMR brought panic from the until now unseen bunnie population, that suddenly appeared from nowhere, scattering in all directions without presenting a target. 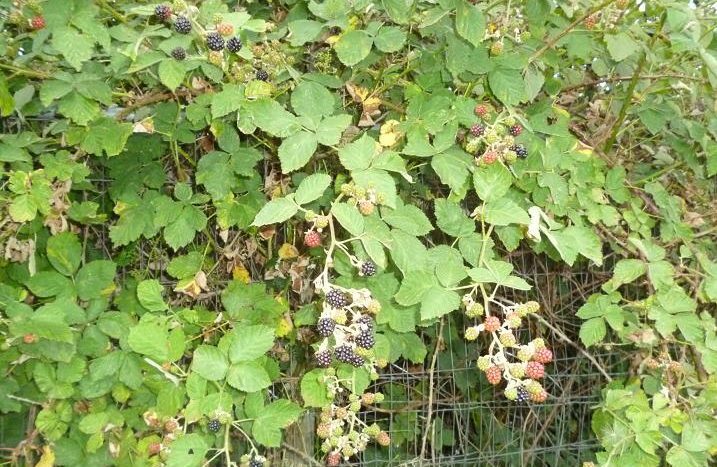 Picking up the rabbit, I walked to the far corner and settled down, amazed to see fully ripe blackberries hanging out of the fence. These must be at least a month early, usually ripening in late August and going through to the first frosts. After bagging up the rabbit, I set about collecting blackberries, while I waited for some movement from the warren sixty yards away. 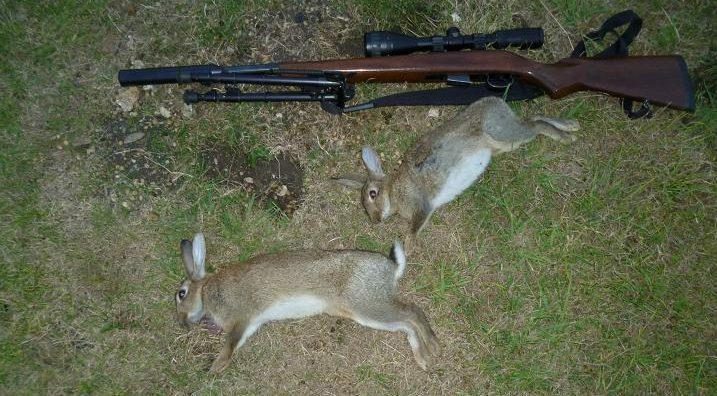 With about a pound picked, a young rabbit appeared at the entrance to a burrow and in slow motion, I returned to the rifle and sighted through the scope. It was still sitting and with the bipod giving perfect support, lined up the cross hairs for a head shot. Number two was down without a kick. Glancing behind as I picked, the bag had about 3 lb of fruit in it before another small rabbit popped out of the hedge at the other end of the paddock. An eighty yard shot with the scope at maximum 12 magnification, this is point and shoot with the HMR in the prone position and another head shot did it’s work. The first time I’d shot this paddock it was used for fattening Dexter cattle. Then it was used to house Ray’s grand daughter’s pony and now with his extended family occupying the farmhouse and an adjacent bungalow, it had become a playground sporting goal posts and a trampoline. Not a good score for me this evening, but three less to dig up the pitch. The remaining rabbits were still lying low and decided to move on to a field the other side of the yard before the light went. 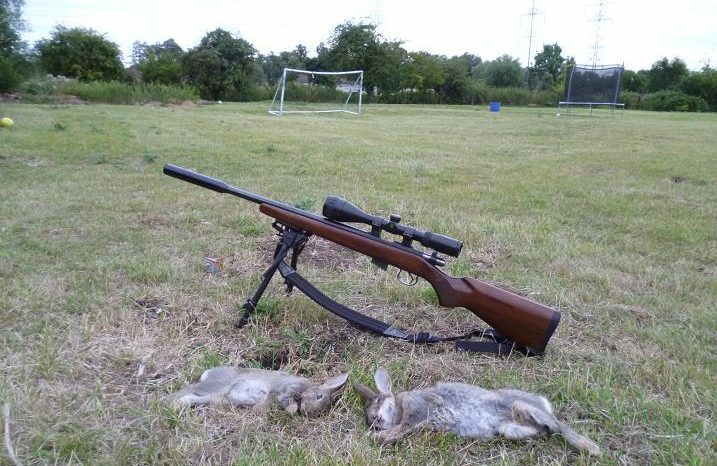 In cover of a tree, I peered over the fence to see several large rabbits feeding in a clear patch and eased the rifle up to rest on a post, downing two in quick succession. This field is only used for hay and with it yet to be cut, it provided perfect cover for other rabbits to slink back to the far edge, brief glimpses of brown bodies not enough for a shot. Climbing the fence I retrieved this pair, bagged them up, then returned to my vantage point, but a twenty minute wait brought nothing but a spectacular sunset. 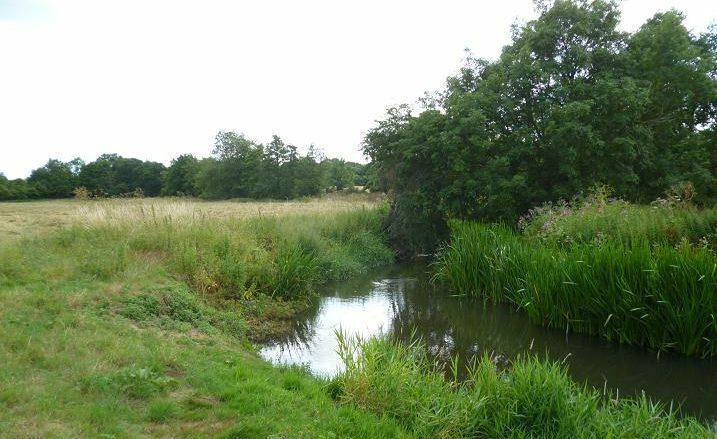 Six weeks have passed since my last visit to the syndicate trout stream near my home, hot drought conditions and weak river flows, due to arable farmers extracting their full quotas from the head waters, have kept me away, but heavy rains early in the week raised my expectations. Many of the syndicate members join only to take advantage of the excellent mayfly hatches on this little river and I too would have been happy to make this season’s memories last until next year, but with my wife keen to get me from under her feet, while she sorted out bric a brac for an upcoming car boot sale, a couple of hours fly fishing was the easiest option. The full flush of spring was long gone, as I trudged across a field of freshly mown hay, stopping at a favourite pool, where the Himalayan Balsam was now over six feet tall, crowding out the opposite bank. Floods in recent years have worn away the gravel tail of this once deep holding area, but it is always worth a few casts, often bringing a few surprises in the shape of a big chub, or trout. I started out with an unweighted Hares Ear nymph, standing on the shallow gravels casting up and across along the bank, but the nymph was untouched as it drifted at the pace of the current, only when it sped up toward the shallows did it attract attention, short tugs and swirls each time causing me to strike into thin air. Stripping back the last few feet answered my curiosity, not a small trout, but a six inch perch had clamped onto the nymph, dropping off as I swung it in. Bumps and swirls continued each time, until the shoal of stripeys got bored and swum back to the pool. Further up on the bend, there was a rise close to the bank, then another. Small black flies were hatching and drifting down, being casually sipped down, or attacked by minnows. The smallest fly I had in my box was a size 18 sedge, which I struggled to tie on, realising late in the operation, that there was varnish in the tiny eye. Greasing the leader, my first cast brought a swirl to the loop on the tippet, while the sedge sat up proud, but ignored. A longer second cast brought an immediate boil and a small dace tumbling across the surface, again to drop off in front of me. The other fish was still there and I made several false casts to dry the sedge, watching it sink into the surface film before it too was engulfed by a fish. A rapid side strike brought better resistance, that rolling fight being another dace of about 3 oz, which again released itself from the barbless hook. On a slow day anything is worth catching. I moved back up above the road bridge to another old favourite pool, where I felt confident that the sedge would bring success, the low level allowing me to wade deep into the pool to present the fly into the flow, where it crosses to the right hand bank. Trout lie up under the bushes waiting for their food pass over their noses. Not today though. I considered putting on a big bushy Humpy in the hope of shocking a trout to rise, but decided to push on upstream. Looking down from the bank into the pool I had just been fishing, my wader crunched on a bright plastic container. Picking up the box, I turned it over to see what it contained. Heavy duty swivels and shot. A poacher’s tool kit. This answered a few questions. Close to the road, with no regular bailiffing it is too easy for gorge lines to be set to catch whatever takes the bait. It doesn’t take long to empty a river this small. This discovery took the wind out of my sails. What is the point of fishing an artificial fly, when you are up against the sort of mentality, that want fish for the pot at any cost to the local environment. There are enough natural predators in the river, pike, mink and herons without the human kind. 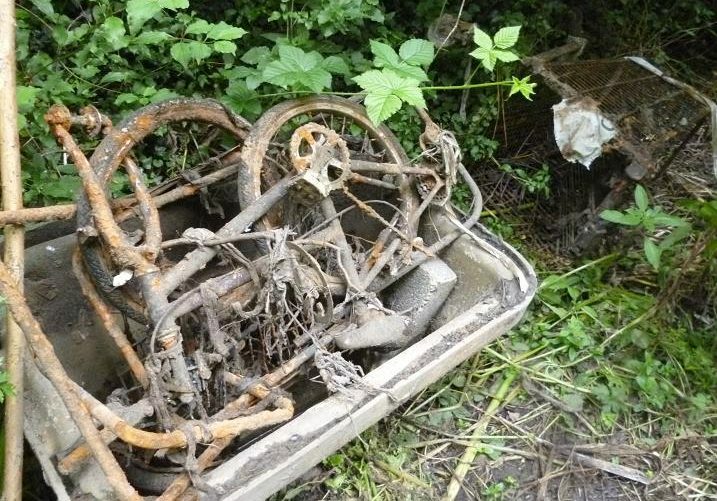 My local community Braybrooke Nature and Fishing Club suffered a blow early this year, when no sooner had they taken over control of the fishing rights on the river that runs through the town, it was heavily polluted, killing thousands of prime fish. 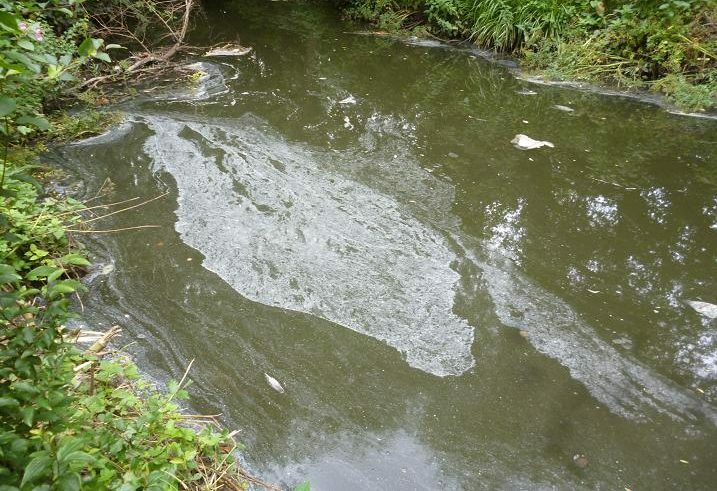 Since then the little river has been polluted a further four times, when various oil based liquids have been fly dumped down rain water surface drains, which feed into the stream. 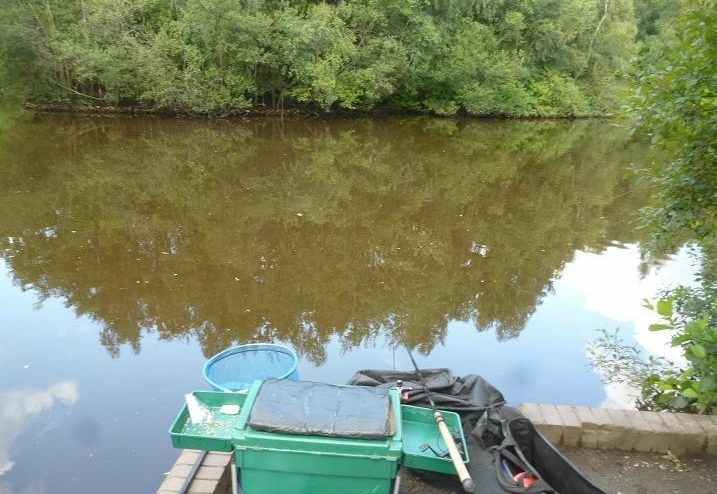 With no more events over the past months, the river appears to have recovered and during a working party to remove snags from the bottom, fish were topping all over the surface and resolved to come back for a fishing session. Arriving after lunch on a sunny afternoon, I chose to fish a swim, which had yielded a shopping trolley, two cycles, a metal chair, part of a BBQ and a building site bucket full of breeze blocks. On getting down to the swim, my heart sank, when I saw the state of the river. It was covered a white scum with large pieces of flotsam drifting downstream. 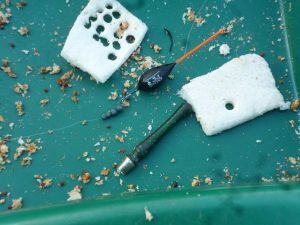 Expecting not to even get a bite, I decided not to waste time setting up a stick float and running line, getting out my pole and quickly attaching a rig, before punching out a 5 mm pellet of bread for the size 16 hook. Without feeding, the rig was plonked into the middle of the scum. The float settled and went under. Surprise, surprise, a rudd bounced on the end of the line. With only half a pint of liquidised bread, this was not going to be a long visit, but encouraged I fed a couple of small balls to the edge of the flow and followed through with the float. More rudd were soon swinging to hand, plus the occasional netter. Setting the float deeper found the first roach of the afternoon, a couple more balls of bread keeping them on station. 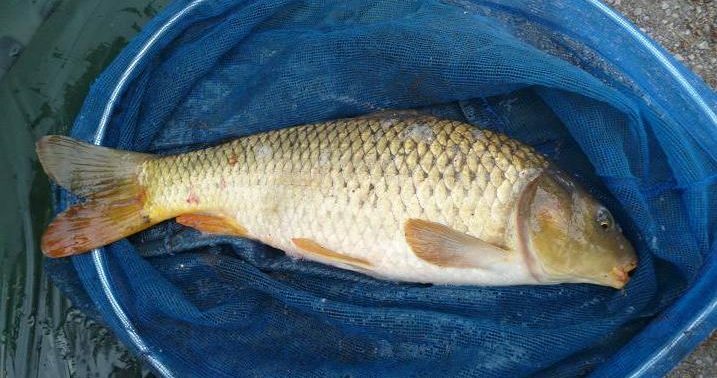 The float dived away upstream and lifted into a small chub, that stormed round the swim. So it went on, silver fish coming every cast, the bread punch once again proving it’s worth, each pellet accounting for a fish. Then the gudgeon moved in, pushing out the roach. 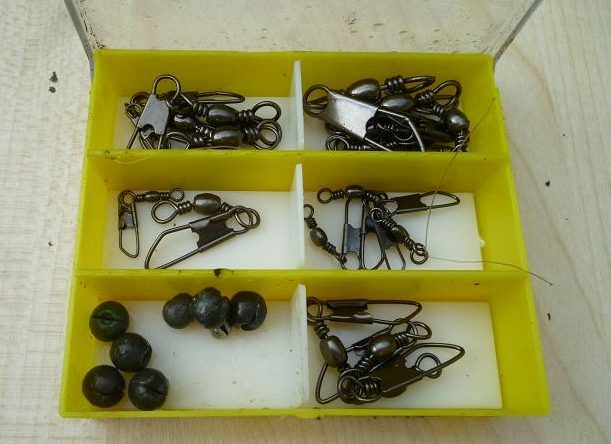 At least these fat little bottom feeders had also survived the period of pollution, when it had been impossible to get a bite on any bait. A nice roach managed to get through the mass of gudgeon, but it was a one off, finding them where ever I place the float after that. 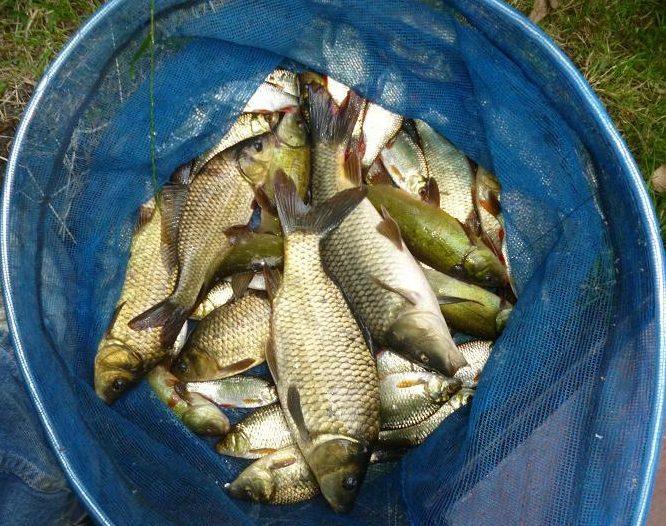 A couple of hours had been enough to prove that the river still holds enough fish to keep an angler busy. Throwing the remains of my punched bread slices into the river as I packed up, I was entertained by the sight of a 3 lb carp demolishing the remnants as they drifted downstream.